Welcome to the old family hotel in the middle of the charming old medieval town of Nyborg. The Hotel is located in the center, overlooking the harbor and the beautiful old streets of Nyborg - renovated and modernized in 2005. Nyborg is a vibrant commercial town with many interesting shops, restaurants and cafes. Located just a stone's throw from Nyborg castle from around 1170 - Denmark's oldest preserved royal castle, which in the Middle Ages was center of the kingdom. The hotel exudes a cozy atmosphere - and the good friendly service is a given thing. Large restaurant for 100 guests or delegates. 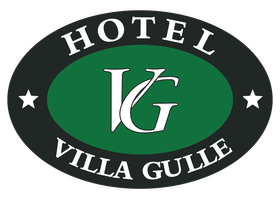 You are most welcome at Hotel Villa Gulle. 2 single rooms with shared shower and toilet. All rooms are newly renovated and equipped with new flat screens. There is free internet in all rooms. When you stay at Hotel Villa Gulle a big delicious breakfast buffet is included in the room rates. We offer two incredibly lovely hotel- and holiday apartments with room for up to 8 people in each. The apartments are situated in the house next door to the hotel, door-to-door at 3 floor. There is no elevator. The apartments are approx. 50 sam and contains a large living room, open plan kitchen, dining room for 8 people, nice bedroom with two single beds. Shower and toilet. The first apartment has a single elevation bed in the living room, and in the other apartment has in the living room a sofa bed for 2 people. Both apartments holds extra beds for up to 4 people. - If you like to stay close and know each other well.